Wings of antlion Cryptoleon nebulosum. From Comstock (fig. 202) . Fore wing base of Lachlathetes contrarius formerly Symmathetes contrarius. From Comstock (fig. 199) . Fore wing base Brachynemurus longipalpus. From Comstock (fig. 198) . Fore wing base of Balaga micans. From Comstock (fig. 197) . Fore wing base of Tomatares clavicornis. From Comstock (fig. 196) . Wings of Palpares aeschnoides. From Comstock (fig. 159) . Wings of antlion Myrmeleon. From Comstock (fig. 158) . 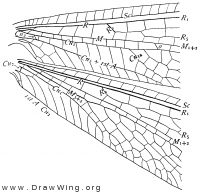 Wings of Acanthaclisis. From Comstock (fig. 156) . Hind wing of an unknown species of anlion (Myrmeleontidae). Fore wing of an unknown species of antlion (Myrmeleontidae).